A great way to start Thirty Days of Love! 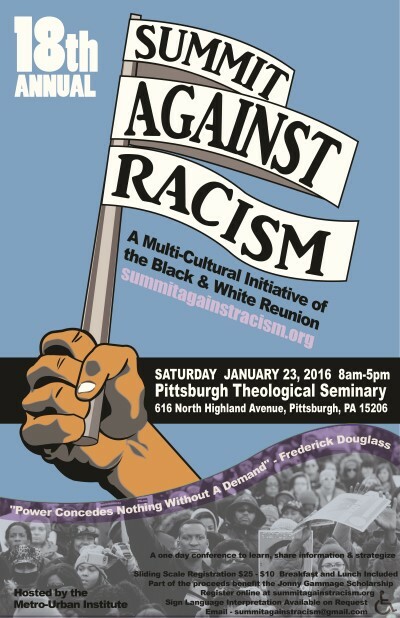 The 18th Annual Summit Against Racism, hosted this year by the Metro-Urban Institute and the Black and White Reunion at Pittsburgh Theological Seminary, will provide a forum for discussion about the current state of race relations in the U.S., what we have learned so far, and pathways to deeper understanding, healing, and social action. Mark your calendar for Saturday Jan 23 from 8am until 5pm. UUs have been a regular presence at this gathering and we hope we’ll have a strong turnout again this year. Regular registration is $25/person. You can list your organization as the “UUs of Greater Pittsburgh” to register at the group rate of $10/person, or pay somewhere in between. No one turned away for lack of funds! Registration fees also support the Jonny Gammage Scholarship. Breakfast and lunch included. More info: summitagainstracism.org.